Objectives: A high intrapatient variability in tacrolimus exposure is associated with poor long-term outcomes after kidney transplant. We hypothesized that a high intrapatient variability of tacrolimus exposure after heart transplant may be associated with cardiac allograft vasculopathy as a determinant of long-term survival of heart transplant recipients. Materials and Methods: Eighty-six heart transplant recipients were included. Patients underwent coronary angiography at years 1 and 4 after transplant and were divided according to low and high intrapatient variability of tacrolimus exposure, with the median variability as cut-off. The primary outcome was the association between tacrolimus intrapatient variability and the progression of cardiac allograft vasculopathy score between years 1 and 4. Secondary outcome was this association with acute cellular rejection. Results: There was no significant difference in the proportion of patients with high tacrolimus intra-patient variability in the group that progressed to higher grades of cardiac allograft vasculopathy (n = 15) versus the group without progression (n = 71) at 4-year follow-up (60.0% vs 47.9%; P = .57). There was no significant difference in the proportion of patients with high tacrolimus intrapatient variability between the 58 patients with 1 or more acute cellular rejection episodes and the 28 patients without rejection (51.7% vs 46.4%; P = .82). Conclusions: A high intrapatient variability in tacrolimus exposure does not appear to influence heart transplant outcomes, unlike its influence on kidney transplant function. A higher immunosup-pression exposure after heart transplant, including the use of prednisone often in a combination of 3 immunosuppressive drugs, may protect against the effects of high intrapatient tacrolimus variability. The immunosuppressive drug tacrolimus has a narrow therapeutic range, and its clinical use is complicated by a large variability in its pharmacokinetics in the general population. The determinants for this interpatient variability have been studied extensively and include genetic factors, comedication, and demographic variables.1-3 Because of this interpatient variability, the tacrolimus dose is routinely adjusted based on drug concentration measurements in blood in order to reach predefined target concentrations. The effect of IPV in tacrolimus exposure on graft vascular disease after heart transplant has not been studied. Cardiac allograft vasculopathy (CAV) is an important problem that limits long-time survival after heart transplant. Cardiac allograft vasculopathy is characterized by proliferative thickening of the vascular intima and progressive narrowing of the vascular lumen. This process is related to both immunologic and nonimmunologic mechanisms.13 These mechanisms include a chronic alloimmune-mediated damage, as well as nonimmunologic factors such as ischemia-reperfusion damage, donor age, hypertension, hyperlipidemia, and cytomegalovirus (CMV) infection. Cellular rejection early and late after heart transplant is an independent risk factor for the development of CAV.14,15 A variable exposure to tacrolimus may lead to an increased frequency of cellular rejection and to the development of CAV. The aim of this study was to determine whether a high within-patient variability in tacrolimus clearance is associated with more rapid progression of CAV in heart transplant patients. The patients were adults who received a heart transplant at the Erasmus MC, University Medical Center Rotterdam (Rotterdam, The Netherlands), between 2000 and 2011. Clinical data of transplants had been prospectively collected. Patients consented to the use of anonymized data for research purposes. This study was conducted according to the ethical guidelines of the 1975 Helsinki Declaration and approved by the Institutional Review Board of the Erasmus MC. All patients received induction therapy with antithymocyte globulin followed by a maintenance immunosuppressive regimen consisting initially of a calcineurin inhibitor (cyclosporine or tacrolimus), prednisolone, and mycophenolate mofetil. The maintenance immunosuppression regimen was thereafter changed according to the tolerance of the drugs and the occurrence of rejection. Surveillance for rejection was performed by endomyocardial biopsies, which occurred weekly for the first 6 weeks, biweekly for the next 3 months, then monthly, and finally bimonthly until 1 year after transplant. A surveillance endomyocardial biopsy was also performed 4 years after transplant at the time of follow-up coronary angiography (CAG). Additional biopsies were performed when there was clinical suspicion of rejection. Surveillance for CAV was done routinely by performing CAG at 1 and 4 years after transplant, according to the protocol at our institution. In a few patients, CAG was performed at a different time due to a clinical indication. Because the aim of this study was to investigate the association between IPV in tacrolimus clearance and the progression of CAV, only patients who had survived the first 18 months after transplant were included. Furthermore, all patients had to use the twice-daily oral tacrolimus formulation (Prograft, Astellas Pharma, Leiden, the Netherlands) between 6 and 18 months after transplant. The primary outcome of this study was the development of CAV, which is defined as progression of CAV score between the 2 predefined moments of angiographic follow-up (ie, the 1st and 4th year CAG). The extent of CAV was graded according to the 2010 International Society for Heart and Lung Transplantation (ISHLT) Cardiac Allograft Vasculopathy nomenclature16 as follows: CAV0 indicates coronary vessels without detectable angiographic lesions; CAV1 (mild) indicates angiography with < 50% stenosis of the left main coronary artery or < 70% stenosis of a primary vessel or any branch stenosis < 70% (including diffuse narrowing) in the absence of allograft dysfunction; CAV2 (moderate) indicates angiography showing < 50% left main stenosis, a ≥ 70% stenosis in a single primary vessel, or isolated ≥ 70% stenosis in branches of 2 systems, without allograft dysfunction; and CAV3 (severe) indicates angiography with ≥ 50% stenosis of the left main coronary artery, or ≥ 70% lesions of 2 or more primary vessels, or ≥ 70% stenosis in branches of 3 systems, or when CAV1 or CAV2 is associated with allograft dysfunction. Patients in whom the CAV score changed between year 1 and 4 after transplant were defined as patients with CAV progression. Patients in whom the CAV score remained constant were defined as patients without CAV progression. As a secondary outcome, we investigated the association between acute cellular rejection and IPV in tacrolimus exposure. Acute cellular rejection was defined as a heart biopsy of at least grade 3A according to the 1990 ISHLT grading system (in the years 2000-2005) or at least grade 2R according to the 2004 ISHLT revised grading system (from 2006 until present).17 Early acute rejection rates were calculated within the first year after transplant, and late acute rejection was defined as any rejection occurring within the period of 1 year and 4 years after transplant. Tacrolimus predose concentrations (C0) were determined throughout the study period in whole blood by use of immunoassays (the Emit 2000 assay [Syva Company, Dade Behring Inc., Cupertino, CA, USA] and the ACMIA-Flex assay [Siemens HealthCare Diagnostics, Inc., Newark, DE, USA]) on several analyzers (the IMX [Abbott Laboratories, Abbott Park, IL, USA], the Cobas Mira Plus analyzer [Roche Diagnostic Systems, Basel, Switzerland], and the V-twin and Dimension XPand [both Siemens HealthCare Diagnostics]). Details on the repro-ducibility and sensitivity of the Emit assay in our laboratory have been published previously.18 Proficiency samples were obtained from the International Proficiency Testing Scheme for Immunosuppressive Drugs (Professor Holt, Analytical Services International, St. George’s University of London, London, UK). The tacrolimus C0 measurements were collected within the period of 18 months posttransplant. For the calculation of IPV in tacrolimus exposure, at least 3 C0 had to be available for an individual patient. Because heart transplant patients are not on a stable tacrolimus dose in the first phase after transplant and because they often use interacting drugs in this period, only data on tacrolimus exposure measured at outpatient clinic visits from 6 to 18 months after transplant were collected. Tacrolimus concentration measurements obtained during hospitalization were not considered. The distribution of baseline characteristics was reported using summary statistics and frequency tables for continuous and categorical variables, respectively. Baseline characteristics were compared with the Mann-Whitney U test for continuous variables and the chi-square test for categorical variables. The IPV was correlated with the CAV grading and also with acute rejection using the chi-square test. Analyses were performed using IBM SPSS Statistics 20 (SPSS Inc., Chicago, IL, USA). All tests were two-sided, and P < .05 was considered statistically significant. Between January 2000 and December 2010, a total of 177 patients > 18 years old received heart transplants at our center. 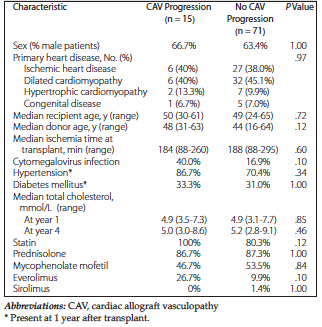 Of these, 33 died within the first 4 years after transplant, 8 did not undergo both angiographic evaluations (at the 1st and 4th year) due to comorbidities, and 2 patients had severe CAV (CAV score 3) already at the year 1 angiography. These 43 patients were excluded from the analysis. Forty-eight patients used cyclosporine as the primary calcineurin inhibitor during the selected time and were therefore excluded from the analysis. As a result, 86 patients using tacrolimus and having an angiographic evaluation at both year 1 and 4 after transplant were included in the present analysis. Of the 86 patients, 15 patients had progression of CAV score between years 1 and 4. Baseline characteristics of the patients are shown in Table 1. There were no significant differences in the age of the recipient, the age of the donor, ischemia time at transplant, cholesterol levels, and the presence of hypertension and diabetes mellitus between patients with and those without CAV progression. There was a trend toward more CMV infection in the group of patients with progression of CAV (60.0% vs 16.9%; P = .10). 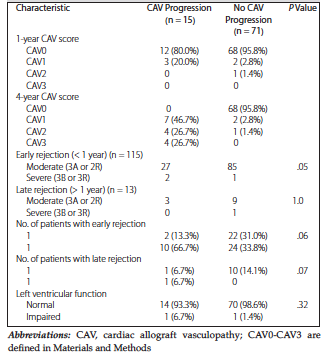 Seventy-one patients had the same CAV score at the year 1 and 4 CAG and therefore did not have progression of CAV (Table 2). Of the 86 total patients, 58 experienced acute rejection episodes within the first year after transplant, and 12 experienced a late rejection. The distribution of early and late rejections and the number of patients with rejection were not different between the groups of patients with and without CAV progression (Table 2). Most rejection episodes (n = 108) were treated with a course of intravenous methylprednisolone, 2 episodes were treated with rabbit antithymocyte globulin, and 18 were treated with an increased oral prednisone dose. Systolic left ventricular function was normal in 14 patients with CAV progression and in 70 patients without CAV progression (Table 2). The patients who developed CAV had an average tacrolimus concentration of 10.8 ± 1.8 to calculate the IPV. This was comparable with the patients without CAV progression (tacrolimus concentration of 10.7 ± 2.4; P = .88). 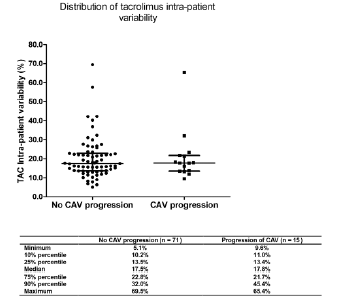 There were no significant differences in distribution of tacrolimus IPV between patients with progression of CAV score and those without (Figure 1). The median tacrolimus IPV in patients who developed CAV was 17.8% (range, 9.6% to 65.4%), whereas this was 17.5% (range, 5.1% to 69.5%) in patients without CAV progression (P = .98). Using the 17.7% value as a cut-off, we divided patients into low and high variability groups. The 43 patients in the low IPV group had a median variability of 13.5% (range, 5.1% to 17.7%). The 43 patients in the high IPV group had a median variability of 22.6% (range, 17.7% to 69.5%). Progression of CAV score was not correlated with IPV. There was no significant difference in the proportion of patients with high IPV in the group with development of CAV versus the group without CAV progression (60.0% vs 47.9%; P = .57), as shown in Table 3. To test whether the IPV correlated with development of acute cellular rejection, we divided the patients into those who had 1 or more rejection episodes in the first year after transplant and those who did not have any rejection in the first year after transplant. 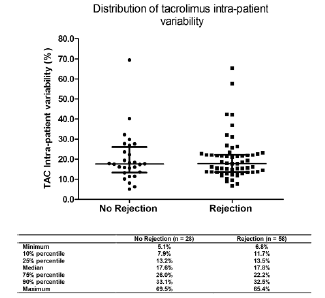 The distribution of the tacrolimus IPV among patients who did develop an acute rejection was also not significantly different versus the distribution of tacrolimus IPV in patients who did not have any acute rejection (Figure 2). The proportion of patients with high IPV in the group of 28 patients who did not have any rejection was not different from the group of 58 patients with ≥ 1 rejections (P = .82; Table 4). We also compared the proportion of patients with high IPV in the group with 3 or more rejections (n = 13) and the group without any rejection (n = 28), but there were no significant differences (P = .57; Table 4). In our study, patients with CAV progression tended to have more CMV infections than patients without CAV progression, although there was no difference between the groups in terms of other atherosclerotic risk factors and the use of statins or immunosuppressive drugs. The design of the study allowed assessment of progression of CAV between 1 and 4 years after transplant, excluding donor-related and surgery-related factors. Our hypothesis was that a high IPV in tacrolimus exposure may influence the development of CAV by lowering the chronic immunosuppressive exposure that allows a good transplant function. However, we found no association between a high IPV of tacrolimus and progression of CAV at 4 years. This suggests that other mechanisms unaffected by the calcineurin inhibitors influence development and progression of CAV. As opposed to the deleterious effects of high tacrolimus IPV for the graft survival found in the renal transplant recipients, we found no such effect on progression of CAV in heart transplant recipients. This may be explained by the compensation of the IPV of tacrolimus exposure by a strong immuno-suppressive regimen, often consisting of 3 immuno-suppressive drugs, including corticosteroids, in our heart transplant recipients. Although the number of patients with at least 1 rejection was high in both groups, most rejections were moderate and treated with a course of intravenous methylprednisolone, which may have compensated for the variability of tacrolimus clearance. Furthermore, most patients in both groups had preserved graft function, suggesting that rejections were well treated. This study has several limitations. It is a retro-spective study, and the time period that we have chosen for the analysis of tacrolimus pharma-cokinetics was between 6 and 18 months after transplant. The early posttransplant period (< 6 mo) is associated with increased tacrolimus exposure variability due to interaction with medications and more frequent hospital admission. A different period of measu-rement may have led to a different outcome. The number of investigated patients was low; therefore, our study may not have enough statistical power to identify the association between IPV and the progression of vascular disease. The evaluation of CAV was only made by angiographic assessment and did not involve intravascular ultrasonography or optical coherence tomography for assessment of preclinical stages of coronary disease. Our results are limited to the period of 4 years after transplant and therefore cannot be extrapolated to more long-term graft function and survival. A high IPV in tacrolimus exposure was not associated with the development and progression of CAV or to the development of acute cellular rejection. The use of a combination of 2 or 3 immunosup-pressive drugs including corticosteroids after heart transplant may protect against episodes of overex-posure or underexposure to tacrolimus. These findings suggest that the implications of a high IPV of tacrolimus clearance may be organ specific and thus less important in heart transplant recipients. Hesselink DA, van Schaik RH, van Agteren M, et al. CYP3A5 genotype is not associated with a higher risk of acute rejection in tacrolimus-treated renal transplant recipients. Pharmacogenet Genomics. 2008;18(4):339-348. Staatz CE, Tett SE. Clinical pharmacokinetics and pharmacodynamics of tacrolimus in solid organ transplantation. Clin Pharmacokinet. 2004;43(10):623-653. Press RR, Ploeger BA, den Hartigh J, et al. Explaining variability in tacrolimus pharmacokinetics to optimize early exposure in adult kidney transplant recipients. Ther Drug Monit. 2009;31(2):187-197. Bekersky I, Dressler D, Mekki Q. Effect of time of meal consumption on bioavailability of a single oral 5 mg tacrolimus dose. J Clin Pharmacol. 2001;41(3):289-297. Pashaee N, Bouamar R, Hesselink DA, et al. CYP3A5 genotype is not related to the intrapatient variability of tacrolimus clearance. Ther Drug Monit. 2011;33(3):369-371. Spierings N, Holt DW, MacPhee IA. CYP3A5 genotype had no impact on intrapatient variability of tacrolimus clearance in renal transplant recipients. Ther Drug Monit. 2013;35(3):328-331. Yong Chung J, Jung Lee Y, Bok Jang S, Ahyoung Lim L, Soo Park M, Hwan Kim K. CYP3A5*3 genotype associated with intrasubject pharmacokinetic variation toward tacrolimus in bioequivalence study. Ther Drug Monit. 2010;32(1):67-72. Borra LC, Roodnat JI, Kal JA, Mathot RA, Weimar W, van Gelder T. High within-patient variability in the clearance of tacrolimus is a risk factor for poor long-term outcome after kidney transplantation. Nephrol Dial Transplant. 2010;25(8):2757-2763. Shuker N, Shuker L, van Rosmalen J, et al. A high intrapatient variability in tacrolimus exposure is associated with poor long-term outcome of kidney transplantation. Transpl Int. 2016;29(11):1158-1167. Kahan BD, Welsh M, Urbauer DL, et al. Low intraindividual variability of cyclosporin A exposure reduces chronic rejection incidence and health care costs. J Am Soc Nephrol. 2000;11(6):1122-1131. Waiser J, Slowinski T, Brinker-Paschke A, et al. Impact of the variability of cyclosporin A trough levels on long-term renal allograft function. Nephrol Dial Transplant. 2002;17(7):1310-1317. Best NG, Trull AK, Tan KK, et al. Blood cyclosporin concentrations and the short-term risk of lung rejection following heart-lung transplantation. Br J Clin Pharmacol. 1992;34(6):513-520. Mehra MR. Contemporary concepts in prevention and treatment of cardiac allograft vasculopathy. Am J Transplant. 2006;6(6):1248-1256. Brunner-La Rocca HP, Schneider J, Kunzli A, Turina M, Kiowski W. Cardiac allograft rejection late after transplantation is a risk factor for graft coronary artery disease. Transplantation. 1998;65(4):538-543. Stoica SC, Cafferty F, Pauriah M, et al. The cumulative effect of acute rejection on development of cardiac allograft vasculopathy. J Heart Lung Transplant. 2006;25(4):420-425. Mehra MR, Crespo-Leiro MG, Dipchand A, et al. International Society for Heart and Lung Transplantation working formulation of a standardized nomenclature for cardiac allograft vasculopathy-2010. J Heart Lung Transplant. 2010;29(7):717-727. Stewart S, Winters GL, Fishbein MC, et al. Revision of the 1990 working formulation for the standardization of nomenclature in the diagnosis of heart rejection. J Heart Lung Transplant. 2005;24(11):1710-1720. Hesse CJ, Baan CC, Balk AH, Metselaar HJ, Weimar W, van Gelder T. Evaluation of the new EMIT enzyme immunoassay for the determination of whole-blood tacrolimus concentrations in kidney, heart, and liver transplant recipients. Transplant Proc. 2002;34(7):2988-2990. Valantine HA. The role of viruses in cardiac allograft vasculopathy. Am J Transplant. 2004;4(2):169-177. Eisen HJ, Tuzcu EM, Dorent R, et al. Everolimus for the prevention of allograft rejection and vasculopathy in cardiac-transplant recipients. N Engl J Med. 2003;349(9):847-858. Costanzo MR, Dipchand A, Starling R, et al. The International Society of Heart and Lung Transplantation Guidelines for the care of heart transplant recipients. J Heart Lung Transplant. 2010;29(8):914-956. Pollock-Barziv SM, Finkelstein Y, Manlhiot C, et al. Variability in tacrolimus blood levels increases the risk of late rejection and graft loss after solid organ transplantation in older children. Pediatr Transplant. 2010;14(8):968-975. Griffin KJ, Elkin TD. Non-adherence in pediatric transplantation: a review of the existing literature. Pediatr Transplant. 2001;5(4):246-249. Shemesh E, Shneider BL, Emre S. Adherence to medical recommendations in pediatric transplant recipients: time for action. Pediatr Transplant. 2008;12(3):281-283. Acknowledgements: The authors have no sources of funding for this study. D. A. Hesselink and T. van Gelder have received lecture fees from Astellas Pharma Inc.
*N. Shuker and R. Bouamar contributed equally to the manuscript.